The handles have soft ergonomic grips, and the ring pull lock means easy storage.The ring pull locking system on these tongs has special brackets to ensure a smooth, durable action that will last years. The best tongs for cooking, grilling meat, or use as serving tongs or salad tongs. They’re heat resistant to 480ºF so you can grab and flip in the hottest environments. Silicone tipped tongs are non-stick friendly to protect your expensive pots and pans. Premium silicone is 100% FDA Grade and BPA Free. It’s heat resistant to 480ºF, and stain and odor resistant. Simply won’t melt, warp, rust or flake into your food. Three Sizes: Small 7″, Medium 9″, Large 12″. Multi purpose cooking utensils such as serving tongs, meat tongs, salad tongs, ice tongs, grilling tongs, pastry tongs. 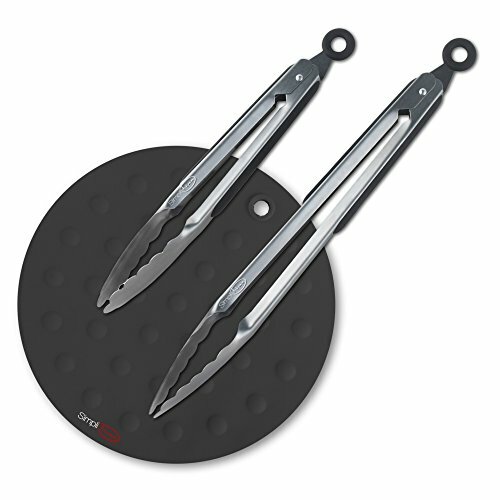 BBQ Tong Sets Grill Tongs.The set is suitable for kitchen cooking and all kinds of outdoor activities. The kitchen stainless steel tongs with sliding lock is convenient for storage. You can control the opening of the tong easily. 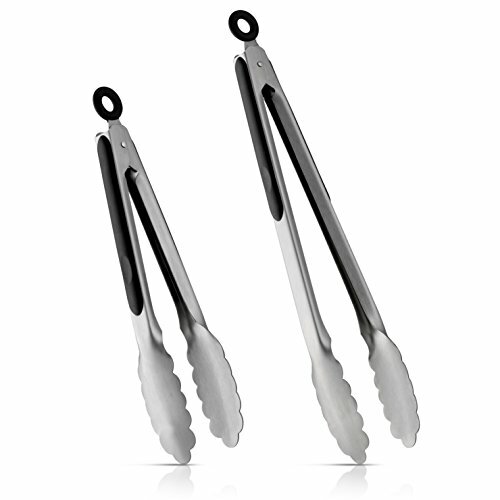 Ollis tongs for cooking made from premium grade stainless steel and silicone, making them stain and odor resistant as well as dishwasher safe. So when you’re done, you can toss them in the dishwasher and put your feet up! Job done!
? 4.9 OUT OF 5 STAR RATING: Professional chefs, amateur cooks and ALL of our customers clearly agree that the #1 rated Precision Kitchenware Tongs are the best on the market.
? ERGONOMIC DESIGN: Non-slip rubber handles, a large hanging loop and gently raised edges provide the perfect grip, ensuring that food arrives on your plate, not the table.
? SAFETY FIRST: Lift and flip with ease, avoid germs and prevent the risk of burns by using these fantastic 12 inch Kitchen Tongs. Premium Quality: Stainless Steel high quality kitchen tongs from top quality material. Heat resistant. Essential Kitchen Gadget: A must have in every kitchen! use for various purposes like cooking, baking, salad, BBQ and more. Comes with holes for hanging. No More Scratched Cookware: Thanks to their flexible silicone tips, our premium tongs will never scratch your cooking or serving surfaces. Safe for nonstick pans, cast-iron skillets & more! Great Grip: Use these versatile tongs to grasp everything from poultry to pasta. Curved, scalloped “scoopers” grab & hold food securely. 2 tong sizes – 9″ & 12″ – provide the right grip for every job. Safer & Sturdier: Made with rugged, rustproof stainless steel & FDA-approved silicone, your tongs will withstand temps up to 480 degrees F. Plus, they’re BPA-FREE & built for years of wear. ✓ TOP QUALITY SUPER TOUGH STAINLESS STEEL ; our tongs have been made from a thick, 1 mm corrosion resistant 304 stainless for unbeatable strength and premium construction, while remaining lightweight and easy to handle! ✓ NON STICK ,HEAT RESISTANT AND DISHWASHER SAFE; our premium silicone tongs are manufactured from a 100% Food Grade Silicone BPA and PVC free that won’t scratch your non-stick pans or grill grates, and are heat resistant up to 480 degrees F, perfect for turning large cuts of meat while barbecuing! ✓ EQUIPPED WITH A PULL-RING TECHNOLOGY AND NON DETACHABLE SILICONE HEADS: our pull ring technology will keep your tongs from opening and closing accidentally which will allow you to facilitate better control while using them. Our tongs have been designed with one piece non-detachable heads to prevent the buildup of bacteria. They are super easy to clean and our hanging ring pull mechanism allows for convenient air-drying and storage! ♥ QUALITY LOVE SIMPLIFINE – An extra set of extended hands comes in handy inside a kitchen. Our top quality Silicone Tongs are just the accessories needed. Get rid of your wooden and disposable tongs. You’ll have the perfect kitchen helper for Professional Chefs and amateur cooks that’s built to last! ♥ BUILT TO LAST, ESSENTIAL KITCHENWARE – 2 sizes have your culinary needs covered. 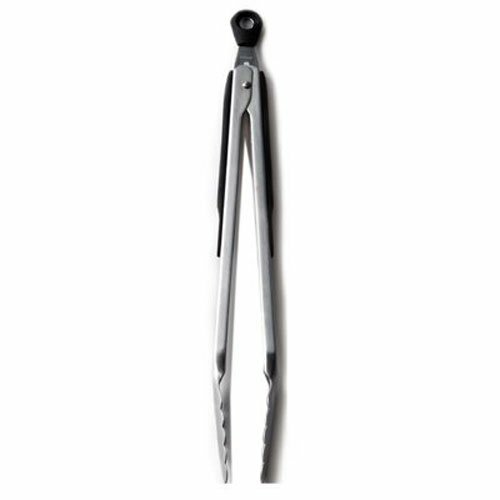 Our ‘SimpliFine’ Supreme Tongs are made with thick stainless steel for strength. Excellent for outdoor barbeque or inside the kitchen. Lifting and turning asparagus, lobsters, turkey and chicken has never been this easy. Works well for serving salad, stirring pasta and even reaching those hard-to-get corners in your tall cupboards. With a FREE No Mess Non Drip Mat this bundle makes a great gift! ♥ SAFETY IS OUR TOP PRIORITY- You’ll love how the non-slip handles have a soft ergonomic grip for safe and comfortable handling of food. 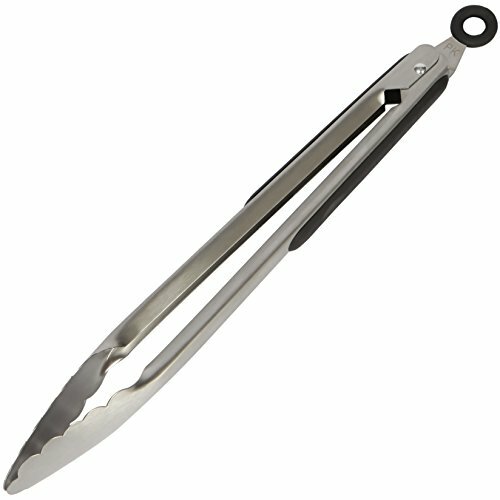 These tongs have metal tips so you do not have to worry about exposing them to an open BBQ fire. The heat resistant silicone sides protect and insulate your hands from high heat. By using these incredible sturdy 9 and 12 inch cooking tongs, you will prevent the risk of dropping the goods and hurting or burning yourself.
? 4.9 STAR RATED TONGS: 1000s of customers love StarPacks silicone kitchen tongs for their durable locking tong mechanism and soft silicone tips. The handles have soft ergonomic grips, and the ring pull lock means easy storage. Clean up is a breeze – simply wipe under hot water or throw them in the dishwasher. Plus youll receive a BONUS comprehensive cooking guide PDF – ‘101 Tips and Techniques for Cooking Like a Chef’ – valued at $5.95 absolutely FREE!
? ESSENTIAL KITCHEN UTENSILS, BUILT TO LAST: StarPack’s premium tongs are made with extra thick 1.00mm stainless steel from the handles all the way to the scalloped steel heads, which are then hygienically coated in silicone so there are no removable parts for bacteria to grow. And the ring pull locking system on these tongs has special brackets to ensure a smooth, durable action that will last years.
? AMAZING GRIP & NON-STICK FRIENDLY: With scalloped steel heads coated in silicone, StarPack’s tongs with silicone tips are firm and angled to offer amazing grip and control. Just compare them to your old nylon tongs or plastic tongs these are the best tongs for cooking, grilling meat, or use as serving tongs or salad tongs. They’re heat resistant to 480F so you can grab and flip in the hottest environments. Unlike pure stainless steel tongs, our silicone tipped tongs are non-stick friendly to protect your expensive pots and pans.